We are going to purchase an above ground pool and plan to build a deck around the top. When choosing a liner, is there anything to keep in mind? The reason this might be an issue is that above ground pool decks are often built over top. The top ledge and top caps, so it will make it hard to remove them. There are certain types of liners that don’t require you to do so. 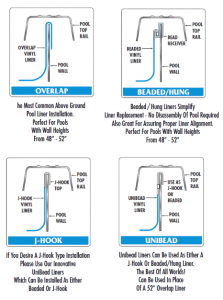 There are basically three types of above ground pool liners – you have overlap, J-hook and beaded. Now overlap and J-hook both, in a way, overlap the wall. The overlap actually does what its name is – it overlaps the wall, and then the J-hook hooks onto the wall. In both of those cases, you have to remove the top rails to be able to do that. The third type is a beaded liner, and those don’t require the top rails be removed because there’s a track underneath that top rail that sits on the wall, that you actually feed the bead liner into. So, if you’re going to build a deck, and it’s going to go over the top rails, definitely go with the bead liner and make things easier when you replace it. I just changed a pentair led light it was a lot different from the older ones (602055). Would be a great how to video because you are pulling the the light and all the wire out. My was 12 volt. kimberlangdon @outlook.com Enjoy your video. The light in the video was a 120-volt.